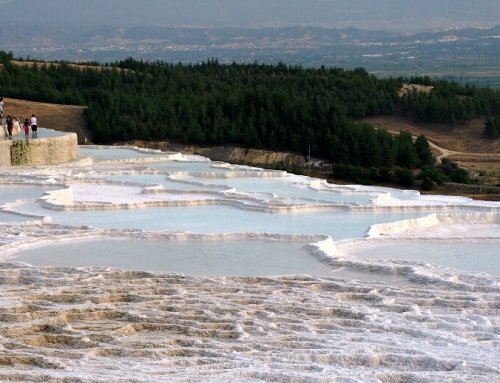 Do you enjoy day tours? 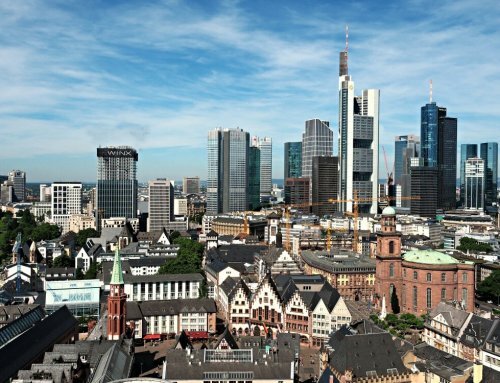 We enjoy the occasional day tour and as we didn’t do any in Frankfurt, we thought we’d check out some Berlin tours. A poster in our hostel was advertising a free Sandemans walking tour of Berlin. It sounded perfect for us. The idea of a walking tour appealed and the added bonus? The idea behind free walking tours is that tours shouldn’t be paid for in advance and as they’re educational, should be affordable for everyone. The guides work for tips, and ask that you tip them what you think the tour is worth. Unfortunately, if you choose not to give a tip you risk looking like a tool! So they kinda aren’t free. Perhaps they should be called a Pay-What-You-Want Tour. 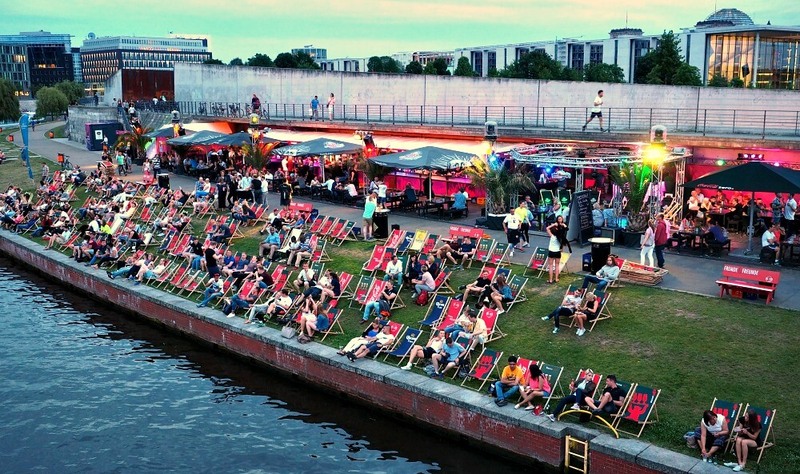 But whatever they’re called, a free walking tour is a budget-friendly way to see Berlin. These tours can be booked online but we were told just to show up at the reception in our hostel. For more information on the best places to stay in Berlin click here. We were met by a young woman who we thought was our guide, but it turned out her job was just to walk us to Brandenburg Gate. Once we were there she gave us stickers to wear on our shirts (not a fan) and told us to wait for our guide. People were milling about everywhere, some were holding up signs advertising free walking tours and others were wearing stickers on their shirts too. The sun was beating down and it was all a bit confusing. But then a team of guides arrived and sorted everyone into manageable groups. One of the perks of a free walking tour is that the guides have to work that bit harder to earn their money. They need to be friendly and knowledgeable like all guides, but they also need to entertain. The more you like them the more you’ll tip. So this works in your favour. Our guide was a perky young woman from Wales with a history degree specialising in the Cold War. She started the tour by letting us know that we were expected to “show our appreciation” and that we would be reminded of this again at the end. She then told us a little about herself and let us know what we could expect from the day. What I liked was that she told stories rather than just relaying a string of dry data. She was also attentive, making sure she spent time speaking to each member of the group individually. And we appreciated the useful local tips she shared that help make life easier for a tourist. 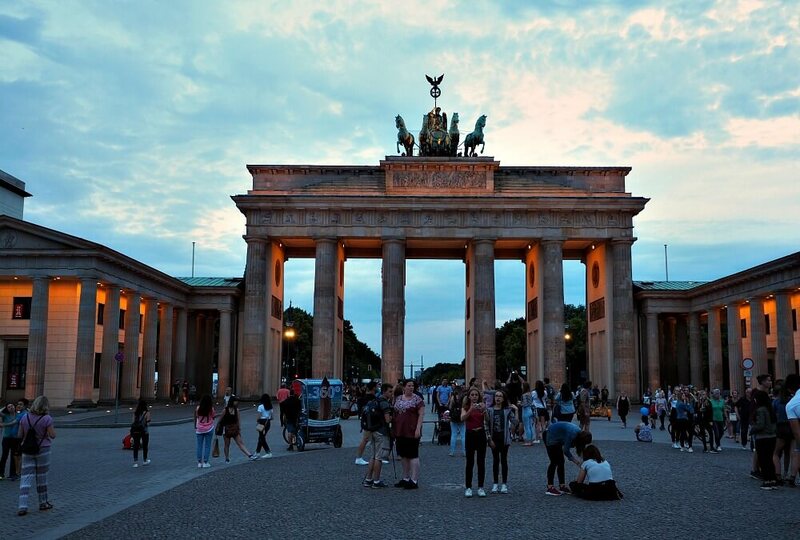 One of Berlin’s most famous sights Brandenburg Gate symbolised the divided city of Berlin. People would come to the Gate and climb to its observation tower so they could see the other side of the city. 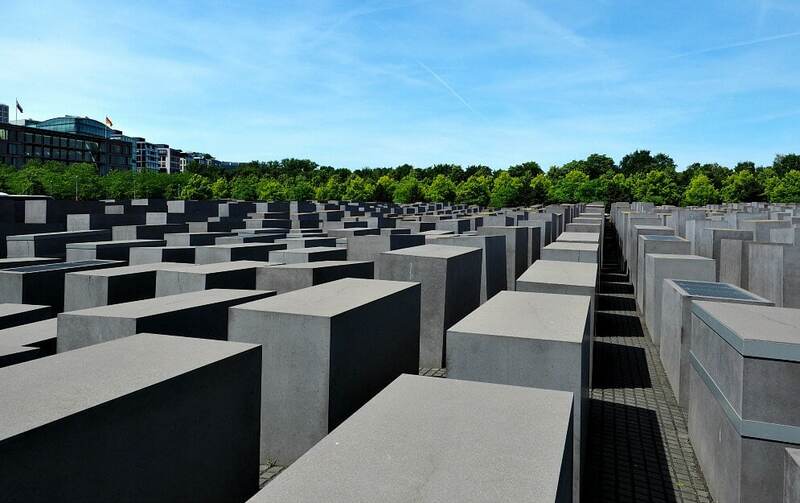 The Memorial To The Murdered Jews Of Europe was built to honour and remember the six million Jewish victims of the Holocaust. 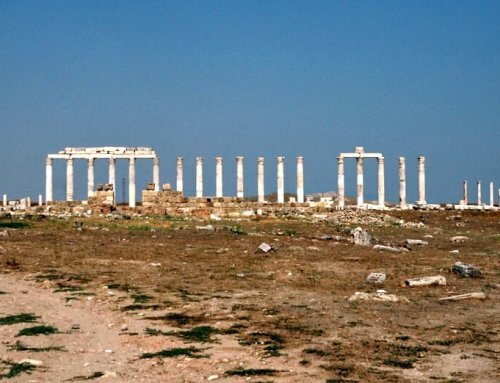 It’s made up of 2,711 grey concrete slabs, or stelae, that are shaped like coffins. We were told that the designer, Peter Eisenman, has never given any meaning or explanation for his design preferring to leave it up to the observer. It’s not beautiful in the traditional sense and at first, I didn’t like it. But walking amongst the blocks I felt their strength and stability. They seemed to have a power all of their own. And I think that’s darn impressive. We stopped under the shade of a tree in an ordinary looking car park. Everyone was looking around confused wondering what we were doing there. The last thing we expected was to be told we were standing where Hitler’s bunker once was. The bunker was where Hitler lived in 1945 and where he married Eva Braun just before they committed suicide. There was a concern it could become a shrine for Neo-Nazis so no traces of the bunker can be seen. The only clue anything out of the ordinary happened here is a simple sign to mark the location. For photos of the bunker then and now click here. 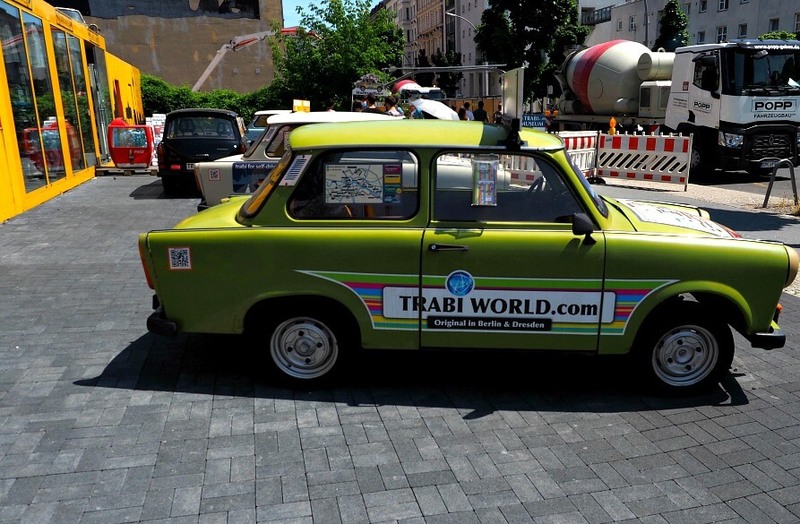 The Trabant was East Germany’s answer to the Volkswagen Beetle. The car had a simple design that was easy to maintain and repair. Unfortunately, after ordering, it could take ten years to have one of these odd little cars in your possession. So, because you could have it straight away, it cost more to buy a second-hand Trabant than a new one! When the wall fell thousands of East Germans crossed the border driving a Trabant. Many of the cars were dumped by their owners who were keen to leave the symbols of their old lives behind. The streets were awash with the vehicles causing mayhem for the governments who didn’t know what to do with them. The car then became a symbol of the end of East Germany and the fall of the Berlin Wall. 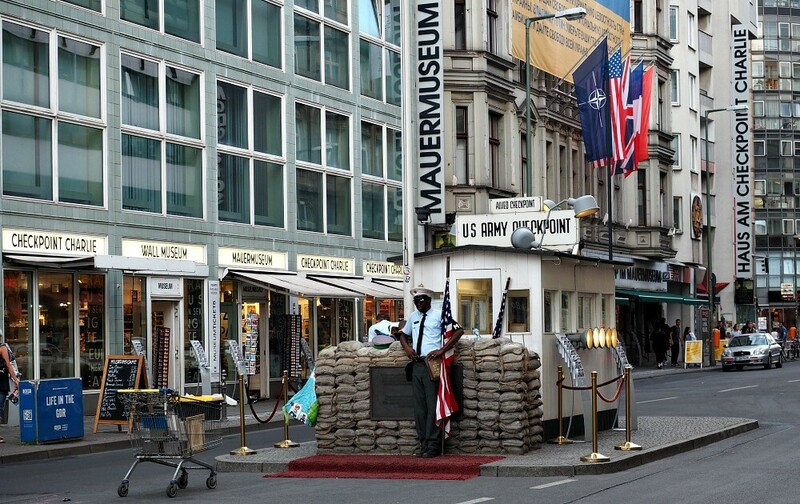 Checkpoint Charlie was the best-known crossing point between East and West Berlin during the Cold War. It came to symbolise the separation of East and West, but these days it’s a tourist attraction with fake guards that you can have your photo taken with. It was the site of an American and Soviet standoff, where armed tanks stood facing each other for 16 hours waiting for the order to open fire. The story goes that an American diplomat was asked to show his papers to East German border guards when trying to enter East Berlin to attend the opera. He refused on the basis that only Soviet officials had the right to inspect his papers. He was only allowed through when he returned with armed soldiers and military jeeps. When they continued to be denied entry to East Berlin the Americans brought their tanks in. Naturally, the East Germans’ Soviet allies responded with the positioning of their own tanks. Everyone was afraid of the possibility of WW III. Disaster was averted when President Kennedy convinced Soviet Leader Khrushchev to withdraw his tanks. The Americans followed suit a few minutes later. 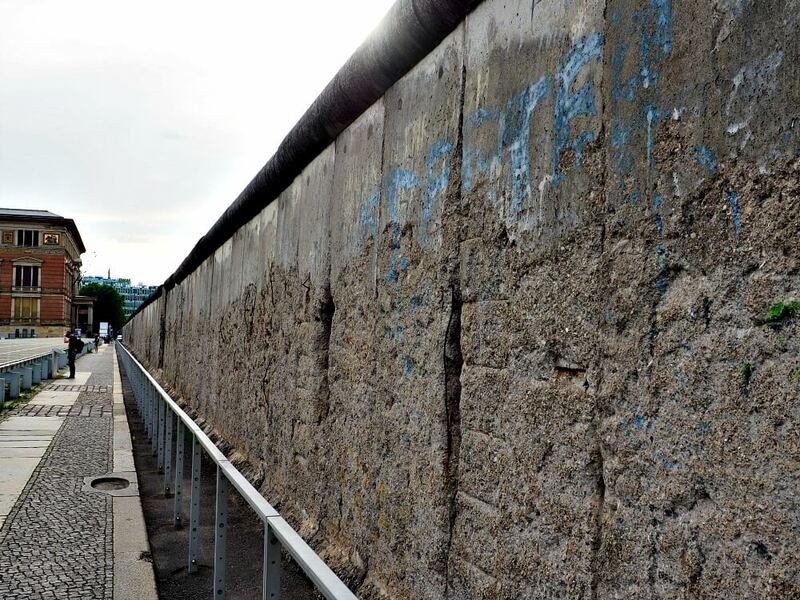 The Berlin Wall was built in 1961 to stop people from crossing from East to West Berlin. A makeshift barbed wire and concrete block wall was put up overnight that completely encircled West Berlin. Over time the barrier was strengthened, guard towers were added and they made the wall more difficult to scale. Our guide told us stories of Berliners waking up to find themselves separated from family, friends, their jobs and even their homes. One story that sticks with me, is of a couple who left their baby with their parents overnight while they enjoyed a night out. They were not to see their baby again until 28 years later when he was a grown man. Do you know the fall of the Berlin Wall happened by mistake? At midnight the gates opened and the people flooded through. I can’t imagine what that must have been like. There were about twenty people on the tour, so not what I would call small, but it never felt crowded and we didn’t have any problems hearing the guide. It lasted for three hours and about halfway through we stopped at a coffee shop for a well-needed break. You can book other tours upstairs at a discounted price. 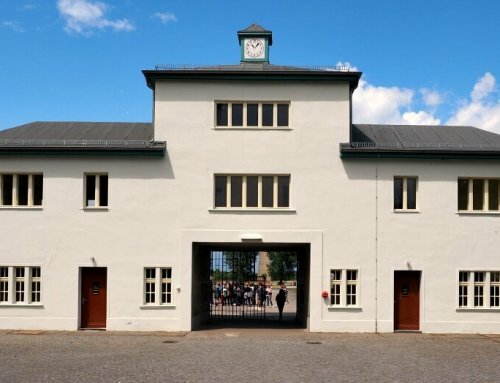 Our guide had given us a rundown of all the available tours, and we decided to book a Sachsenhausen Concentration Camp Tour. As promised, at the end of the tour our guide asked us to show our appreciation for her hard work. Five euros seemed to be the going rate so we tipped ten for the two of us. Honestly, it was value for money. I enjoyed the stories our guide told and the little-added jokes she shared – and she really knew her stuff. She also seemed to genuinely care for everyone’s well being, trying to keep everyone out of the sun as much as possible. We enjoyed the tour and think a free walking tour is a great way to see a city. 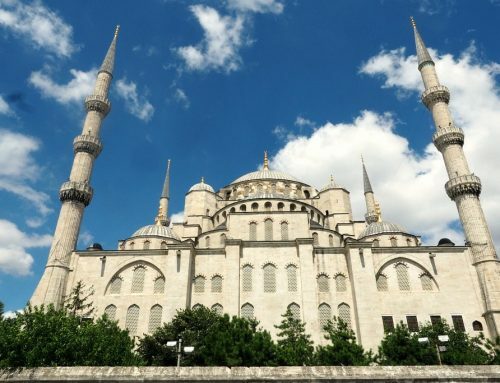 Have you ever done a free walking tour? Tell us about it in the comments below. We’d love to keep sharing the magic of travel with you! So feel free to subscribe to our email in the box below.